West Torrens Birkalla SC are delighted to announce the signing of 2016 Sergio Melta Medal winner, Yvan Boyokino, for the 2018 PlayStation 4 National Premier League SA season. 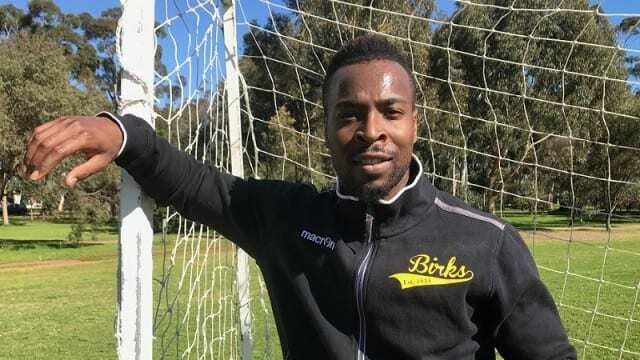 Yvan, 29, has made the move to Jack Smith Park after 5 seasons with Adelaide Blue Eagles, telling that he is excited for the change. “I am really, really excited. I am already training and I can’t wait to start training with the boys,” he said. “I have always had a lot of respect for the players at Birkalla. I always saw them as a great team who never had an ego, even outside of the game they are lovely and I can’t wait to be a part of the group. A highly sought-after player at the end of every Premier League season, Yvan acknowledged that his move to the West was an easy decision after meeting with club Chairman, Amin Ayoubi. “The first thing that influenced me was the approach from Amin. He is a great person and really professional in the way he approached me and the timing of approaching me. Since we have met he has been a great supporter and a great help for me. Yvan, who can play either on the wing or as a striker, is looking forward to contributing to the team and told that the present line-up was another factor for the move. “One of the reasons I decided to sign with Birkalla is the existing squad, I could see a good mixture of players. They have a solid defense and a really good group of boys up front, along with experience throughout. My strongest abilities are speed and dribbling and with their help I can hopefully provide some goals and assistance to the strikers. Recently appointed Senior Coach, Simon Catanzaro, is eager to have Yvan with him heading in to the new season. “Yvan is a massive signing for the club and it signals our intention of competing again for finals football in 2018,” he said. “I have coached against and watched Yvan the past few years and I am really looking forward to working with him next season.